SMFS supplies high quality steel framing predominantly to the domestic house construction market . 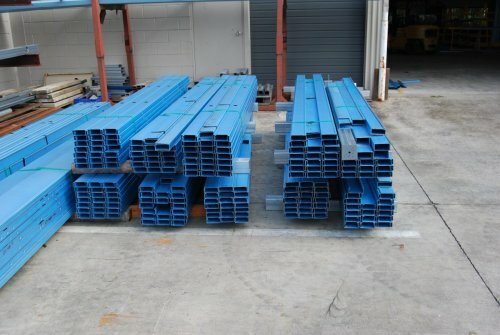 Our frames are engineered from N1 - C4 using BlueScope Steel’s TrueCore steel product, being G550 high tensile coil steel. This product gives us the flexibility to design lightweight framing solutions while still maintaining strength. Steeline Metal Framing Systems understands the needs required for DIY owner builder projects. We offer our clients a comprehensive service, starting right from the planning stage, offering advice on necessary changes as appropriate. Our detailer will then transpose a customer's plans into CAD format to formulate an accurate price estimate, as well as testing the engineering parameters of the project. On placement of the customer's order, our Structural Engineer reviews the finished plans and signs off as to the structural integrity of the steel frame. Our staff will then liase with the customer to ensure that our manufacturing process meets their requested time frame for either site installation or transportation to any location by road, rail or sea. We also offer help with the on-site erection process (depending on the location), as well as sourcing other materials for the project, including specific trades such as Plasterers, Electricians, Plumbers, etc. View our large range of products and specifications. We offer the complete package of materials for transport to your project. View our gallery for past and current projects.